Ahhh I’m so excited for this post as this will be my very first swatch! I just got my camera, so I can now finally take better quality photos. Even better, my nail polish order also arrived in the mail. 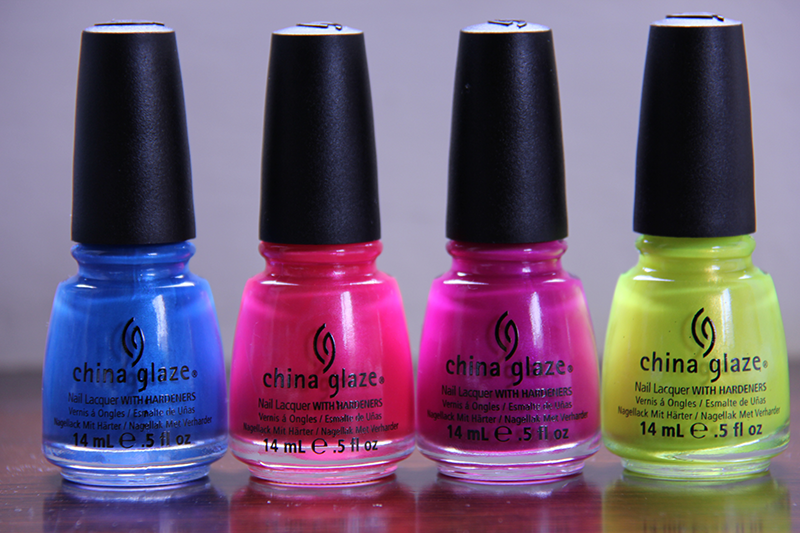 Today I will be reviewing 4 polishes from China Glaze’s Summer Neons 2012 collection. The names of the polishes I will be reviewing are: Splish Splash, Love’s a Beach, Beach Cruise-r and Sun-kissed. First is Splish Splash. My camera couldn’t really capture how beautiful and bright this color actually is once on the nail. 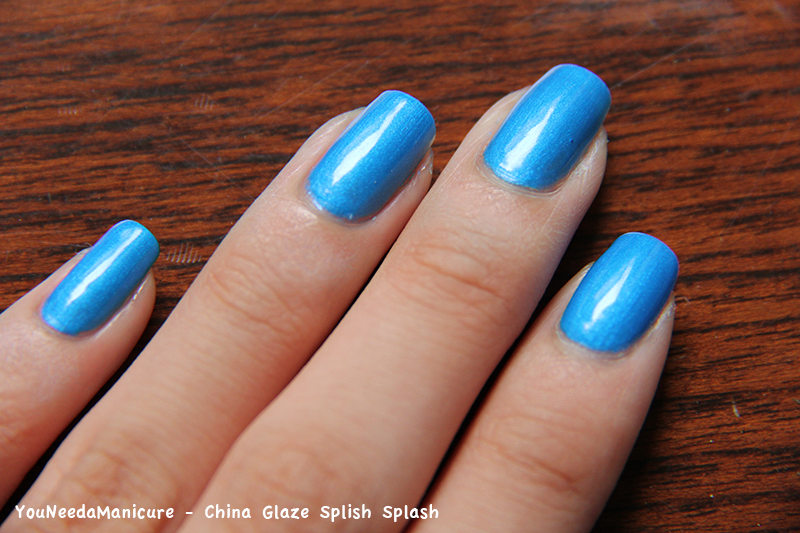 Its actually a bright blue color (please refer to my bottle photo to see how the color is actually like). My absolute favorite. I’ve been trying to find a blue polish that isn’t too light like a baby sky color, and not too dark, something in between. This was the one. In the polish, there are blue and (if I’m not mistaken) silver micro-shimmers. I was really surprised to know that the polishes in this collection dries matte. I did not expect that at all! I started swatching this color and added topcoat because I thought the polish was supposed to dry glossy. When I tried out the next color though, I realized that this collection is supposed to be matte. Photos after this will have no topcoat. Love’s a Beach. 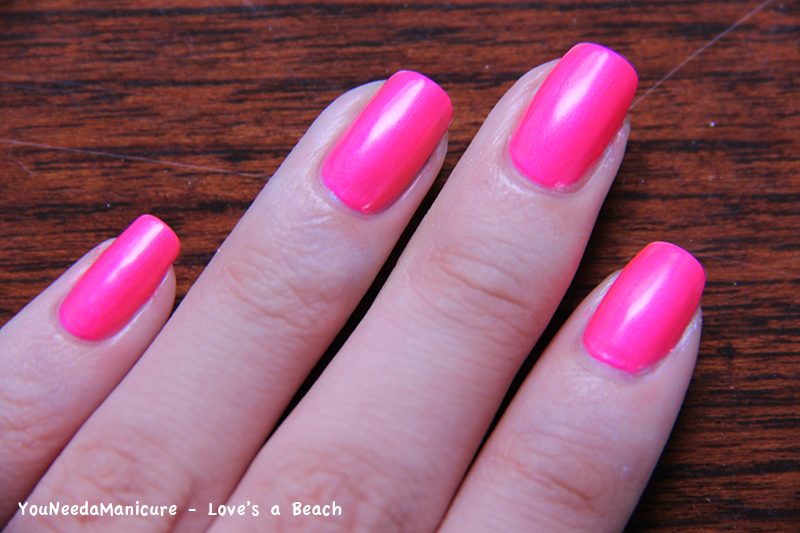 A bright hot pink/fuchsia color with pink and silver micro-shimmer. Super bright. Opaque in two coats. A bright pink-purplish color, with purple and silver micro-shimmer. I really like the tone of this color, especially because purple is my favorite color. 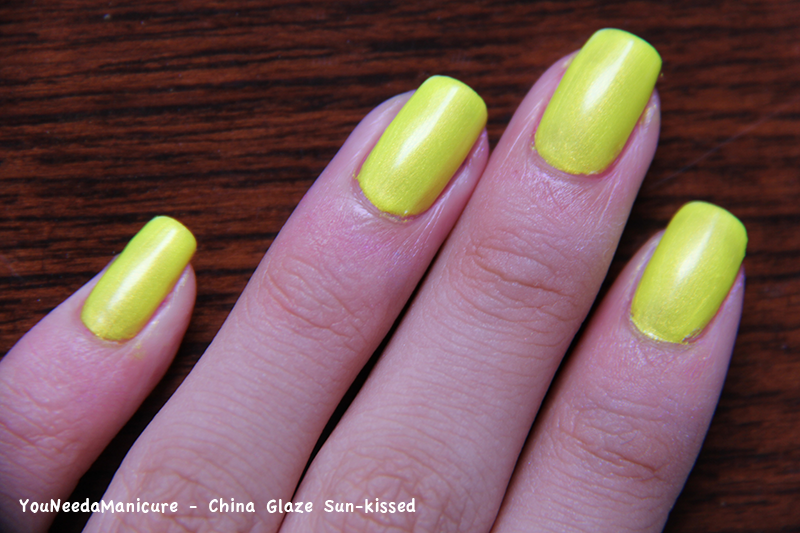 Sun-kissed is a very bright yellow highlighter color with warm gold and lime green micro-shimmer. If you look closely though, it is not completely bright yellow but more of a lime green color. This color was sooo bright it makes my hand a bit darker on camera. I had difficulty capturing a good photo of this. This is also one of my favorites, but I feel that I won’t be wearing this as much as Splish Splash, because they are such a attention grabber. I have to say I really like the polishes from this collection. This is my very first China Glaze order, and I am very impressed with the formula and colors of these polishes. Splish Splash is a everyday wearable color. As mentioned earlier, some of the colors I think I won’t be wearing as often because they are so bright. I will definitely be using them for nail designs and tutorials though. All polishes dry fast and removal was relatively easy. The formula wasn’t thick. If you have a good amount on your brush, it should not be very difficult to apply. The only thing I don’t like about these polishes is that when you remove them, some polishes stain around your cuticle. They can be easily removed with polish remover though. 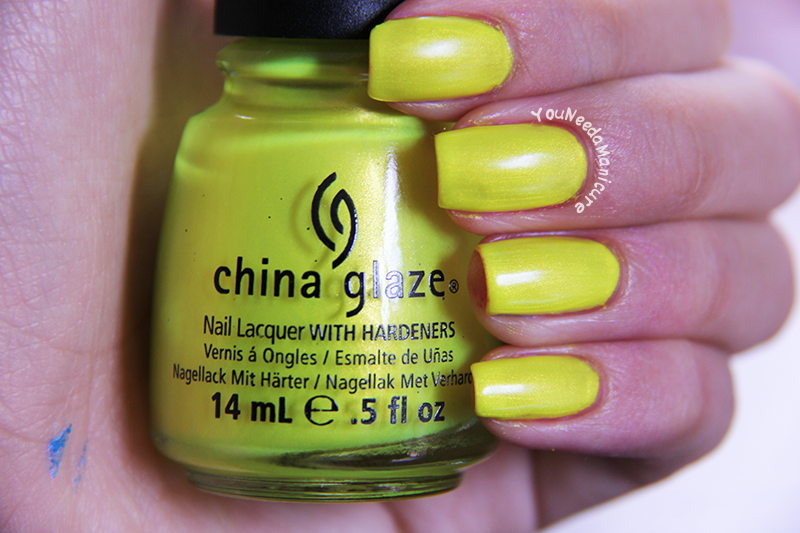 Despite that, I will definitely be repurchasing more China Glaze polishes in the future. Also, sorry if the lighting isn’t consistent throughout all the swatch photos. I just got my camera and I’m still learning about lighting and different ISO settings and such. I also didn’t use a tripod to take these photos, and the camera is quiet heavy. If you have any tips and tricks, please let me know! 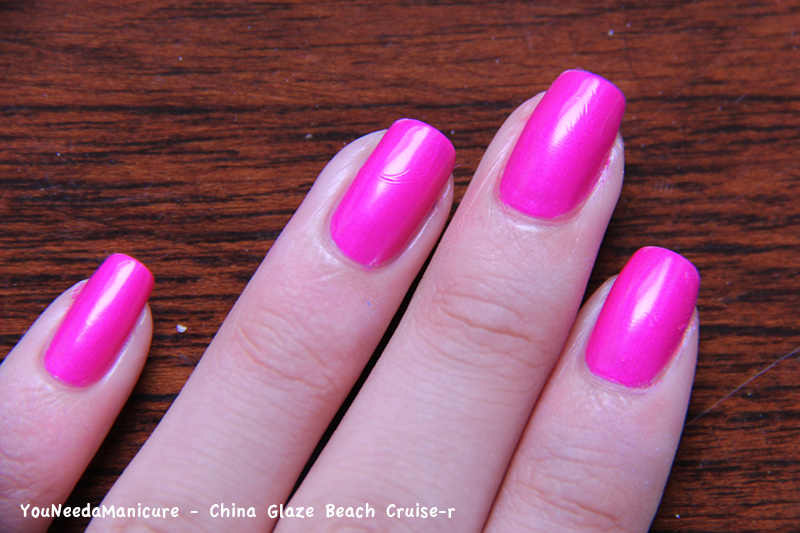 You can find more about China Glaze’s 2012 Summer Neon collection on their website here.